July 6, 2016 April 1, 2019 - The 'Noms. A moonshine and herbal cocktail! 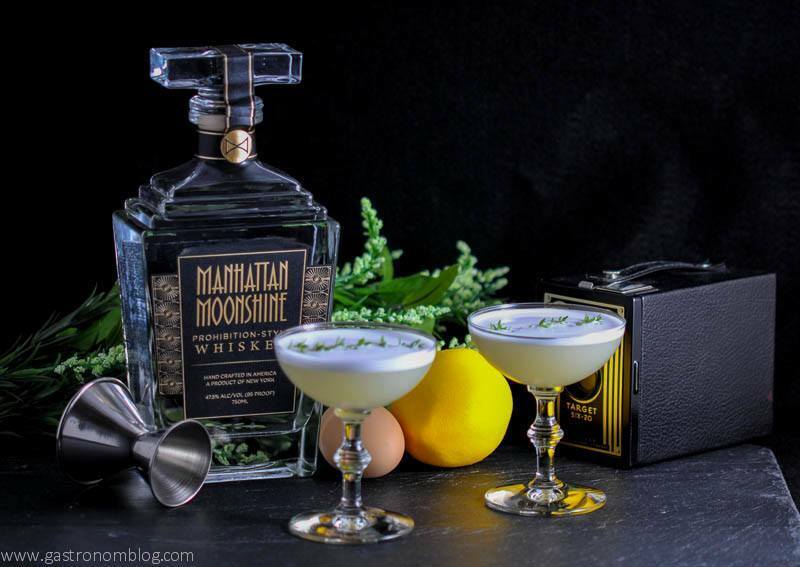 This combination of moonshine cocktail and the herbalness of a thyme cocktail marry well together! When you hear the word moonshine, you tend to get visions of good ole boys up in the hills, right? They might be distilling their white lighting out of a homemade still. Then they are loading it up into mason jars to be smuggled off in the trunk of a bootlegger’s souped up jalopy. What you don’t think about is a moonshine distilled in the heart of New York City by an upstart distillery. This distillery wants to pay homage to the Prohibition Era, where white whiskey (aka moonshine) was introduced to the masses, where? At speakeasies and underground jazz filled parties that graced the pages of F. Scott Fitzgerald’s classic tome, The Great Gatsby. This spirit is what the folks at Manhattan Moonshine want to inspire with their carefully crafted moonshine. We were lucky enough to get to check out recently and use in our original cocktail, the Thyme to Shine. This post contains sponsored content brought to you by Manhattan Moonshine. We received a bottle to review, but all opinions presented here are 100% our own. For further information please see our Disclaimer page. 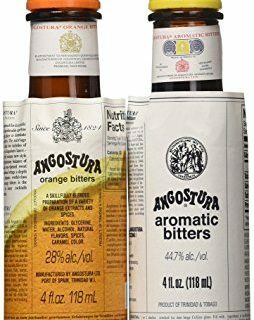 What Ingredients are Needed for the Thyme to Shine Cocktail? Prohibition was also an era where craftsmen were inspired to shine. Whether it was Chanel’s bold new fashions gracing the pages of Vogue, the beautiful glass work of the Tiffany Studios, or in the beautiful Art Deco architecture of Frank Lloyd Wright. White whiskey is truly a craftsman’s spirit, the quality of the ingredients and skill of the distiller comes through in the flavors of the moonshine. With no barrel aging process that can help smooth out the rough edges, a good quality white whiskey is highly dependent on the ingredients used. Also depends on the mash bill and the skill of the the distiller. 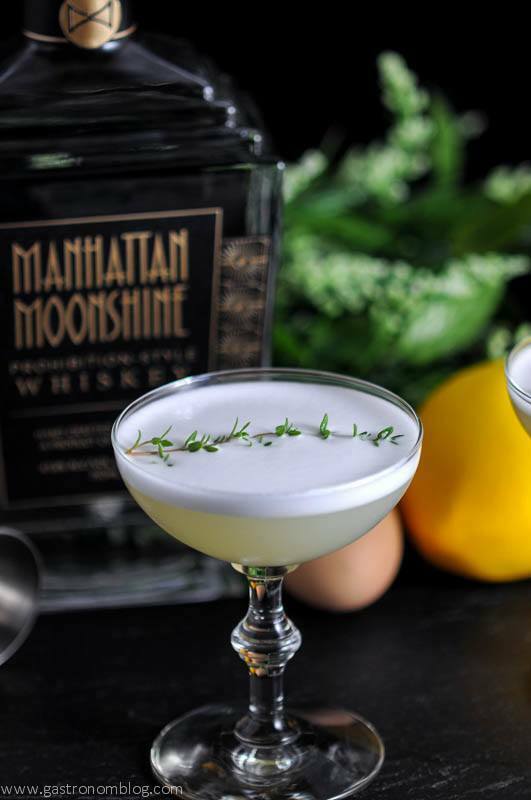 The folks at Manhattan Moonshine wanted to make a moonshine that would fit right in with the fine arts of these esteemed craftsmen. They do this with their distinctive and attractive Art Deco decanter bottle. 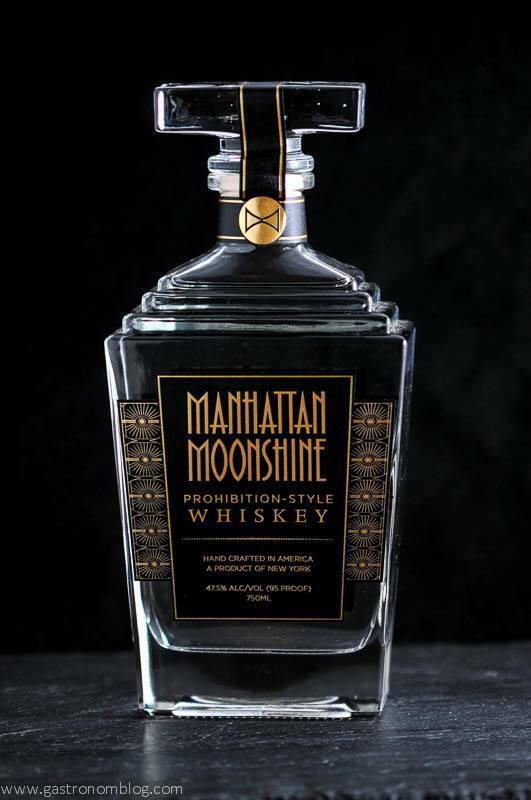 Manhattan Moonshine also uses a special mix of grains grown in New York including rye, spelt and oats to give their whiskey a distinctive flavor. Oats are a very rare ingredient in distilled spirits, as American spirit makers typically use corn, wheat and malted barely to make their mash. Oats can be difficult to use in distilling, as they require special milling and care when processing through the still. The addition of oats to the grain bill gives a very distinctive flavor of sweet and nutty cereal to a spirit. When combined with the spiciness of a rye, the oats gives Manhattan Moonshine a complex crisp flavor. 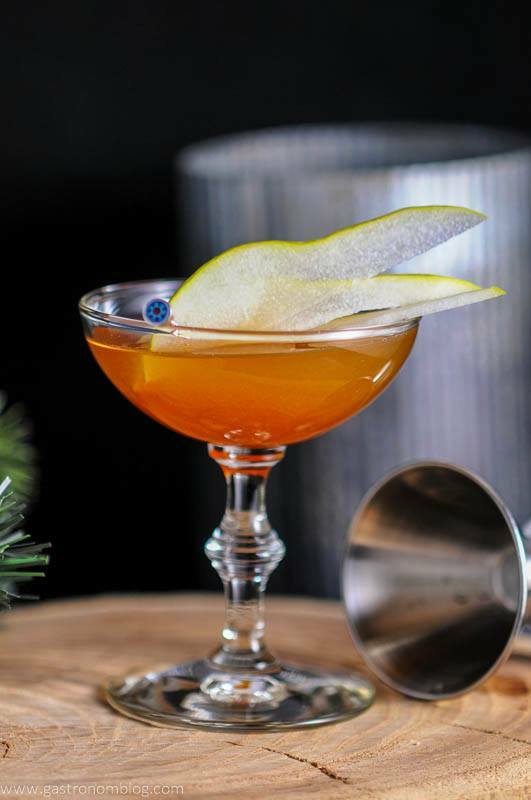 It’s full of nutty grain and warming spices with a subtle edge that brings a little boozy bite. Being un-aged, Manhattan Moonshine doesn’t have the flavors of oak and caramel that a traditional aged spirit would have. But, trust us there is still a complexity that works well in a cocktail. What Flavors did we Want to Use? With our bottle arriving in the summer, we wanted to make a cocktail that would highlight the moonshine and embracing some summer herbs. 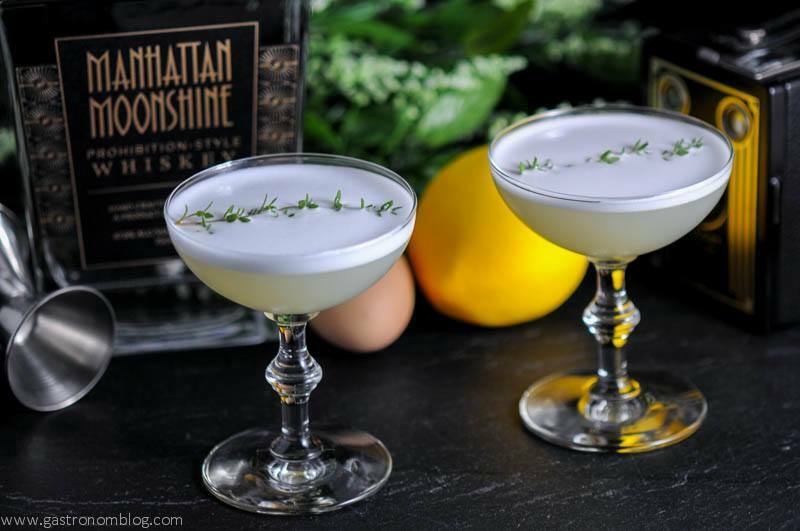 After trying Manhattan Moonshine neat, we decided that it would pair well with some of the thyme simple syrup we made using thyme from our garden. 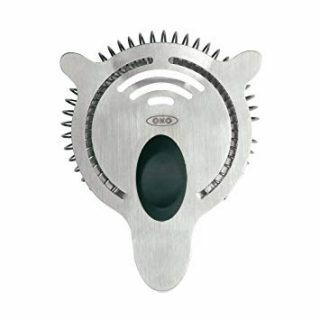 Use this handy tool Chef’n ZipStrip Herb Zipper ! 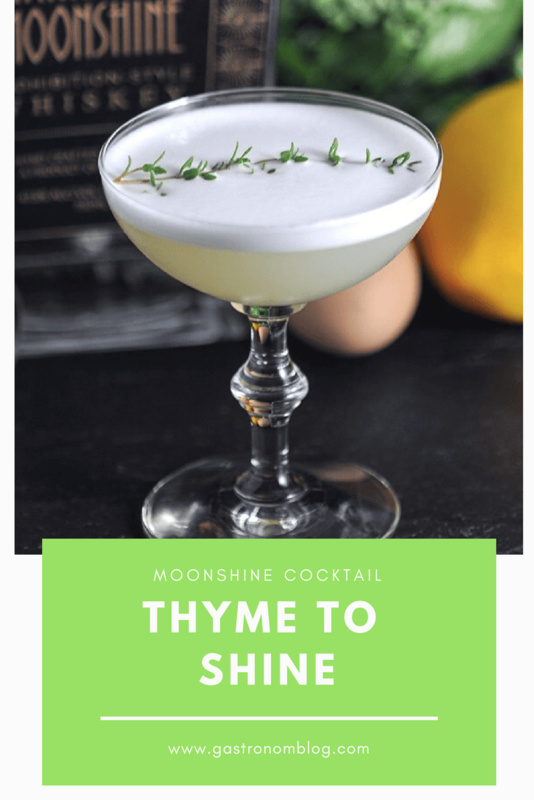 The thyme syrup has a aromatic sweetness which works well with the nutty spiciness of the moonshine. 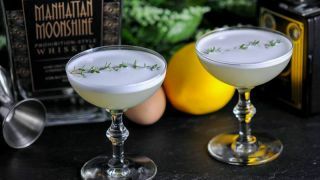 Fresh lemon adds fresh brightness and pleasing sour note to this thyme cocktail. An egg white adds a rich meringue flavor and gives the Thyme to Shine a velvety smoothness. Delicious for summer sipping, the Thyme to Shine brings herbal freshness and a boozy edge in a glass. 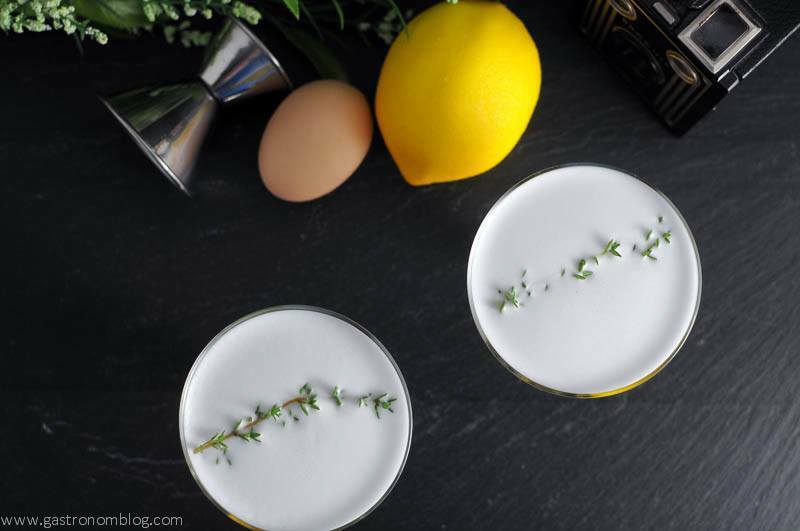 A thyme simple syrup and lemon sour recipe with a moonshine base. 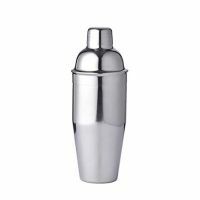 Combine all ingredients in a cocktail shaker and shake for all you are worth! The egg white will foam up and everything will mix after about 20 seconds. Add a few ice cubes and shake again until chilled. 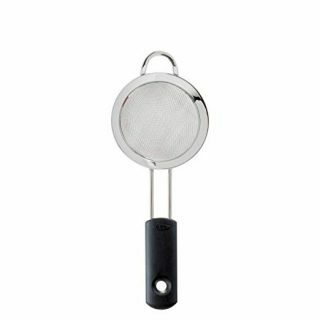 Combine water and sugar in a small saucepan, bring to boil over medium heat. Once it boils, pull off the heat, and add the thyme leaves. Let steep for 10-15 minutes, then strain out the leaves. Let cool. Store in the fridge up to 7 days. PIN THIS THYME TO SHINE COCKTAIL RECIPE FOR LATER! I love the sprig of thyme in this drink. So classy! Thank you! We thought it was a great touch! Wow I never would have thought about using thyme in a cocktail! Great idea! Thank you! 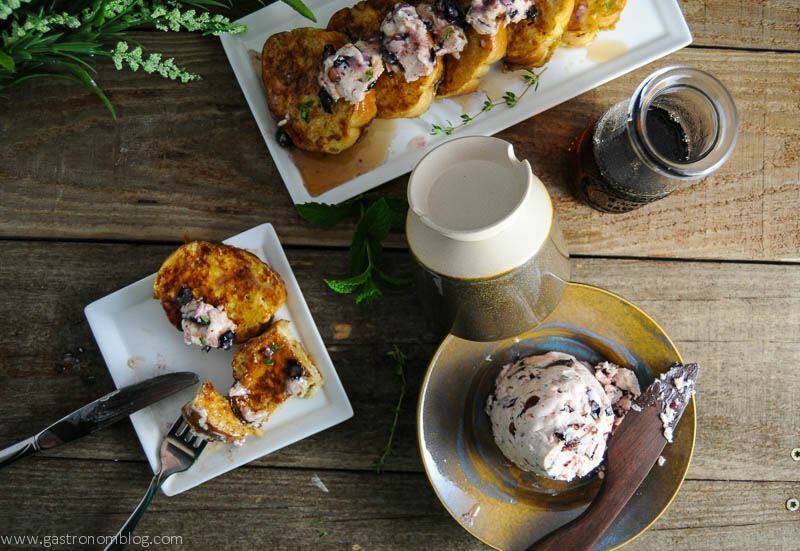 It is such an “earthy” herb, that it balances the flavors really well! Cheers! This looks amazing. I would have never thought to put Thyme in a drink like this but it just makes absolute sense. Also, I didn’t realize that Moonshine had gone mainstream. This is a must have drink for me now. It really is a great flavor combo! We thought it was great that moonshine is “fancy” now, haha! 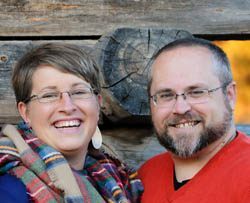 Hope you check it out! This cocktail is so beautiful! This is soooo very Great Gatsby and I love it! 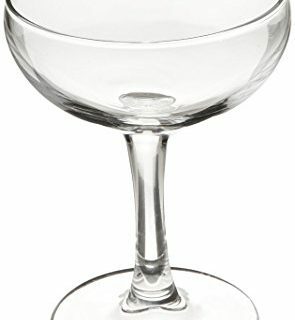 Would make an amazing party cocktail for a cool 20’s theme! That’s what we thought, too! We loved that bottle, and I am thinking of ways to use it later, ha! Ooh I am in love with that bottle. The design alone is gorgeous and intriguing! Must seek it out…and then make this cocktail, which sounds right up my alley! I know, right? I am thinking of ways to use it after it is empty! Hope you try the cocktail out! Cheers! Thanks! Hope you try it, cheers! my husband would love this drink! I would love to sip on it while watching Peeky Blinders hah! LOL, that would be a perfect fit! Cheers!